Student iBase version 2.0.0 introduced the ability to upload a school database to an Apple iPhone or iTouch (herewith referred to as iPhone only).The iPhone requires the Student iBase for iPhone app which is available for purchase from the Apple app store. Data is uploaded via a wireless network connection. Once the process is started the two devices automatically find each other via the "Bonjour" protocol which is silently installed with the Apple iTunes software. For this reason it is recommend iTunes be installed on the Student iBase PC. The upload (or synchronising) procedure is initiated in Student iBase by clicking the iPhone icon (labelled Mobile) on the toolbar to reveal the Upload Settings window. The iBase for iPhone app is then also launched and the synchronise button is tapped to reveal the connections window. A switch in this window puts the iPhone into 'listen' mode where it will search for Student iBase over the wireless network. If the connection is successful the iPhone will be listed in the Upload Settings window along with its IP address and Port number. 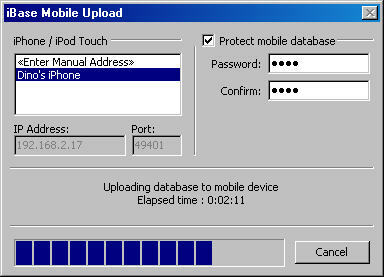 Uploading the database is then a matter of selecting the iPhone in the list of devices and clicking the Upload button. If Bonjour is not available on the Student iBase computer or the two devices do not find each other, the iPhone will not be listed in the Upload Settings window. Instead the user may manually enter the iPhone's IP address and Port number. The Upload Settings window also allows the user to set a password. This password will be needed when launching the iBase for iPhone app. Although optional, it is strongly recommended a password be set in order to protect sensitive data in the event the iPhone is lost or stolen.